Southern senior Peyton Anderson competes in the 100m dash at the River Valley Open on April 2 in Bidwell, Ohio. 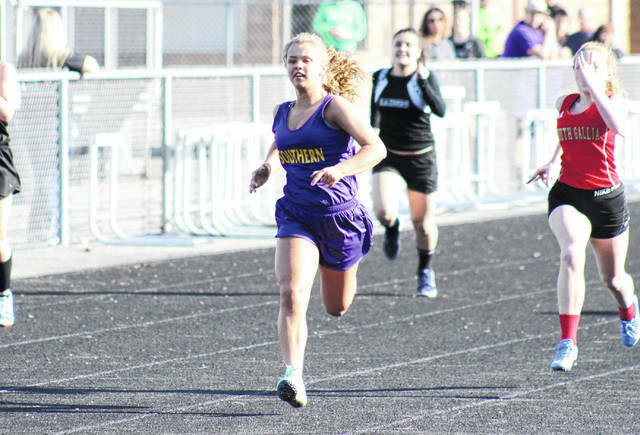 THE PLAINS, Ohio — The Southern track and field team competed at the Athens Invitational on Wednesday at AHS, with the Lady Tornadoes placing fourth and the SHS boys taking fifth. The host Lady Bulldogs won the girls’ team title with a score of 177. Warren was second at 160.5, a full 95 ahead of Nelsonville-York in third. Southern’s fourth place total of 50 was 27 ahead of Miller in fifth. Athens ‘B’ and Belpre rounded out the seven team field with scores of 22 and 10 respectively. The Lady Tornadoes’ lone gold medal of the day came with Kayla Evans clearing 4-10 in the high jump. Evans also scored in three other events, placing third in the 300m hurdles at 52.91, fourth in the 100m hurdles at 18.01, and fourth in the long jump at 14-2.5. Baylee Wolfe was fourth in the high jump at 4-8 and fifth in the 300m hurdles at 55.25 for the Purple and Gold, while Anderson claimed sixth in the long jump with a leap of 13-3.5, and was sixth in the 100m dash with a time of 15.10. SHS senior Sydney Roush was third in the 3200m run with a time of 13:16.49, and fourth in the 800m run at 2:42.41. Roush and Anderson were joined by Jacynda Glover and Kelley Shaver to take fifth in the 4x200m relay with a time of 2:10.51. Mallory Johnson claimed fourth in the 800m run with a time of 1:08.41, while Baylee Grueser was sixth in the discus throw at 83-04. Warren won the boys championship with a score of 167, 22.67 ahead of Athens in second. Nelsonville-York claimed third with a 98, Belpre was fourth at 41.33, while Southern was fifth at 35.33. Athens ‘B’ with 19 and Miller with 15 completed the seven-team field. The Tornadoes also earned their lone gold medal in the high jump, with Brody Dutton clearing 5-8. Chase Bailey tied for sixth in the event at 5-00, while also claiming sixth in the 200m dash with a time of 25.62. SHS senior David Dunfee was second in the shot put and fourth in the discus throw with respective distances of 41-6.5 and 116-05. Trey McNickle earned third in the long jump at 18-8, and fourth in the 100m dash with a time of 12.09, while the Tornado relay team of Garrett Smith, Isaac McCarty, Aiden Hill and Weston Thorla was fifth with a time of 52.93. Visit www.baumspage.com for complete results of the 2019 Athens Invitational.